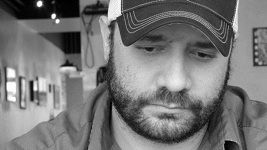 Nick Jarvis (Austin, Texas) is a filmmaker who received his BA in Creative Writing from Metropolitan State College of Denver, then attended four years of film school at Colorado Film School, University of Colorado, where he was also a creative writing judge for the Denver School of the Performing Arts. He has sold one screenplay, and wrote and co-directed another feature, Pearman, which hit the film circuit in 2012. His short films have won awards at the Brooklyn International and Estes Park film festivals. He judges for Austin WebFest and reads for the Austin Film Festival, for which he currently writes coverage. Where are you from, Nick? University of Colorado and Colorado Film School. I swapped turns telling horror stories at recess in 3rd grade. Writers: Raymond Carver, Robert Boswell, Michael Knight, Faulkner, DeLillo, Ellison. Filmmakers: Ramin Bahrani, Milos Forman, Bob Rafelson, Hal Ashby, Sidney Lumet. Teaching them the rules, then breaking them. When someone claimed something was implausible and it happened to be one of the only elements of my story that was true, I kept my mouth shut. I don’t know. “Nebula,” it’s what we’re made of. Or how about “guilt,” it seems to inspire my favorite stories. To Kill A Mockingbird for the 8th graders I tutor. I forgot how good it is, as well as Harper’s Lee subtle sense of humor and skill with words.